In addition to going long the yellow metal itself, which I discussed in my last blog post here, I am now long the gold miners. I placed 4% of my trading portfolio capital into a long NUGT position. NUGT is the triple-long senior gold miner ETF. Gold miners reversed higher this afternoon, following gold itself higher. And I am playing for metals and miners to have sprung a bear trap here, failing to break lower and subsequently sprinting higher. I entered NUGT at $13.09. My stop-loss is if GDX loses $18 on a closing basis. So, I am keying off GDX instead of NUGT for the stop. 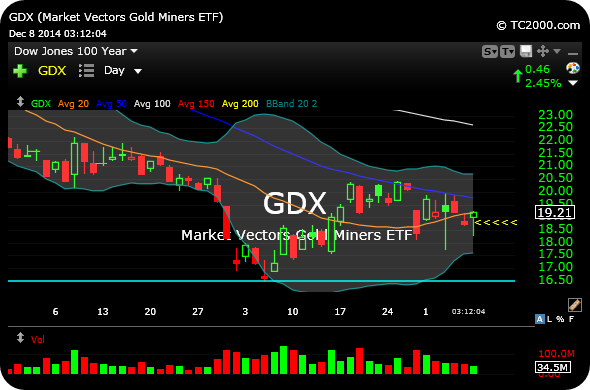 Below, you can see the GDX daily chart, first, showing the upside reversal today. Also note the GDX is still back at its 2008 crash lows (horizontal light blue line), a major prior price area where buyers had presented themselves in a meaningful way previously. 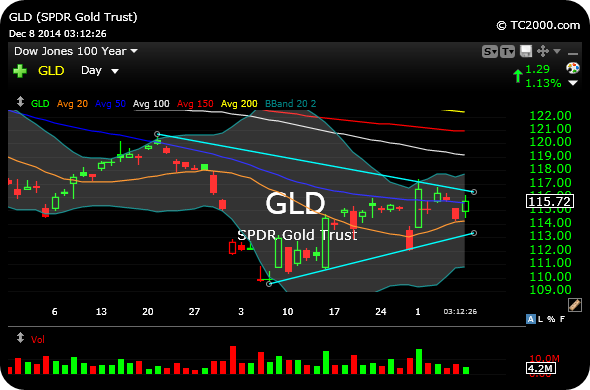 Next, the gold ETF daily chart, showing the consolidate under the 50-day moving average. These are risky, highly volatile trades and instruments. But my track record has been solid with them largely because of the focus on limiting downside risk while being able to capture the large upside pops.